The title of this week’s blog entry seems to be a recurring theme in my essays about Georgia’s natural history. Productive natural landscapes such as longleaf pine savannah, oak forests, and canebrakes are disappearing or nearly extinct due to fire suppression; and the same goes for “strawberry plains,” chinkapins, and many species of animals which will be the focus of part 2 of this series. Prescribed burn at the Savannah River Site in South Carolina. After decades of a Smokey the Bear fire suppression policy, the U.S. forest service finally realized controlled fires were beneficial to the ecology. Fire has always been an important component of Georgia’s ecology. Before people colonized the region, wildfires occurred irregularly but were unchecked and often burned on a large scale. Fires were more common during interstadials because of an increase in thunderstorm frequency. Oaks increased in abundance in correlation with wetter climate cycles, thanks to lightning-sparked fires that opened up the forest canopy for these fire tolerant/shade intolerant trees. Mammoths, mastodons, and ground sloths littered the forest floor with tree branches and killed trees by eating the cambium under the bark. During droughts, this litter dried into tinder ready to explode when struck by lightning. I hypothesize that windstorms and tornadoes were common in the south during much of the Pleistocene. Frigid katabatic winds blowing off the Laurentide Glacier met warm tropical fronts from the Gulf of Mexico and the Atlantic Ocean in the atmosphere directly over the southeast. Because cold air sinks, when cold fronts hit warm fronts, great downdrafts of cold air microbursts snapped trees in half and leveled forests. All this deadwood added fuel to fires as well. Pollen records show grass was abundant prior to human colonization of the southeast–evidence that natural fires and other disturbances must have been common, though lower CO2 levels in the atmosphere, drier climate phases, and megafauna foraging and trampling contributed to the expansion of grasslands as well. Following the extinction of the megafauna, forests grew densely for a few thousand years but Indians changed this situation. Indians began burning the woods to improve habitat for game, and to eliminate shrubby growth that might provide refuge for ticks, stinging insects, large predators, and hostile human warriors interested in carrying off attractive women. Burning the woods created favorable habitat for bison, deer, and turkey–staples of the Indian diet. Most fires would not kill healthy mature trees but would eliminate saplings and unwanted brush. (See the appendix below for tree species fire tolerance.) Fire created open woodlands which were pleasing to the eye. Open woodlands allowed more sunlight to reach ground level and in combination with fire sparked the growth of nutritious grasses, flowering herbs, and berry bushes. Much of the southern uplands consisted of open pine savannah in the coastal plain, and pyrophitic oak forests in the piedmont. Canebrakes that stretched for miles grew along the piedmont riversides and creeks. C.C. 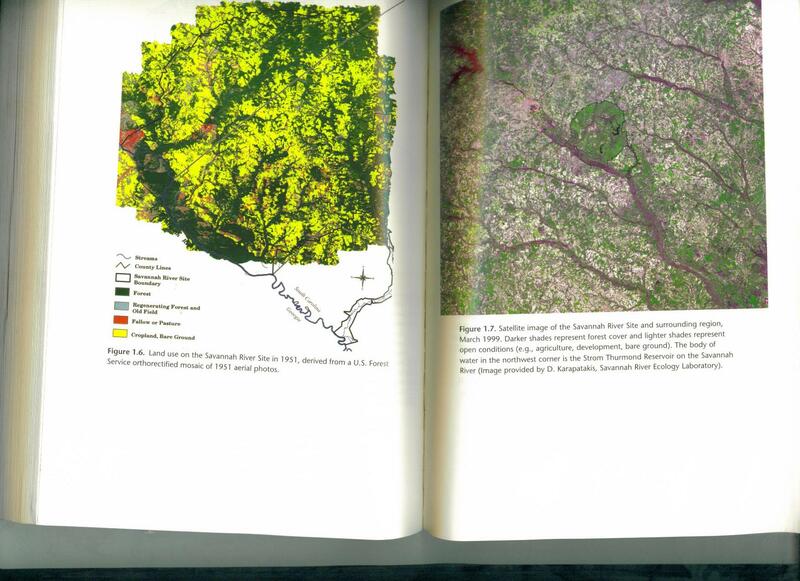 Frost reconstructed a map of the natural environments on the Savannah River Site based on descriptions of original land acquisition surveys. This probably is a good representation of a typical section of southeastern coastal plain. Presettlement vegetation map of the Savannah River Site reconstructed by C.C. Frost and published in the below referenced book. Longleaf pine savannahs made up 80% of the landscape. Bottomland hardwoods, pyrophitic oak forests, longleaf pine-turkey oak sandhills, canebrakes, and Carolina bay wetlands were also common. The area also includes a bluff forest with northern species of plants but there was less than 300 acres of this. SRS lies within the coastal plain so longleaf pine savannah dominated the region until 1820. Note all the yellow in the above map which represents pine savannah. The pink represents canebrakes, now a completely extinct ecotone on the site, having been replaced by bottomland forests. Pyrophitic oak forest (the brown) were well represented as well. Early European settlers copied the burning practices of the Indians, but about 1820 an improved version of the cotton gin was invented, making cotton farming highly profitable. This is when the burning stopped, and much of the natural forest was converted to farmland. 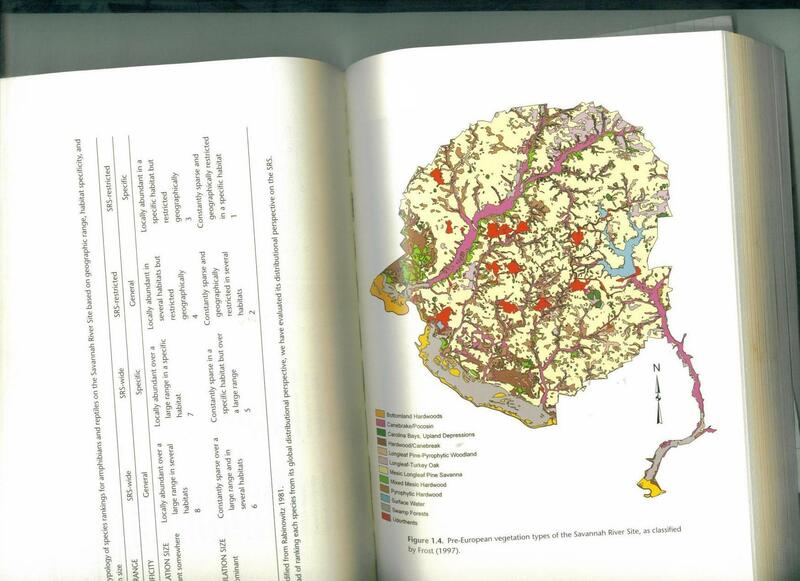 Vegetation map (also from the below referenced book) of the SRS in 1952 after the government purchased the land. The federal government replanted much of the land in slash and loblolly pine because longleaf pine was hard to obtain, the trees grew more slowly, and seedling quality was poor. By 1952 the remaining forests were of poor quality. Fire suppression ruined the upland forests, and logging the best trees degraded the bottomland forests. Most of the forests had been replaced by horizon-to-horizon cotton farming. Note on the map that the cleared land closely corresponds to the former range of the pine savannah. Note also how canebrakes completely vanished, replaced by bottomland forest. Canebrakes required specific flooding and firing regimes to persist. Bamboo cane colonized areas near rivers where the trees were either destroyed by prolonged floods or by the nesting of enormous flocks of passenger pigeons which would kill the trees via overfertilization as their dung accumulated beneath their nests. Bamboo cane continued to dominate only if the canebrakes were burned about once every 10 years. Fires more frequent than that created grassland; fires of lesser frequency than that led to the growth of bottomland hardwood forests which shaded out the cane. Canebrakes provided lots of fodder for bison, denning sites for large carnivores, and habitat for many small species from swamp rabbits to rare types of butterflies. The burning of canebrakes took place in winter, and it sounded like combat because the hollow stems exploded upon ignition. Canebrakes were formerly very common in the piedmont. In 1773William Bartram travelled through central Georgia on his way to the Gulf Coast. His party traversed on high, dry, gravely ridges but were always in sight of extensive cane meadows which flourished at the bottom of the hills alongside creeks. On the ridges themselves pyrophitic oaks forests grew. 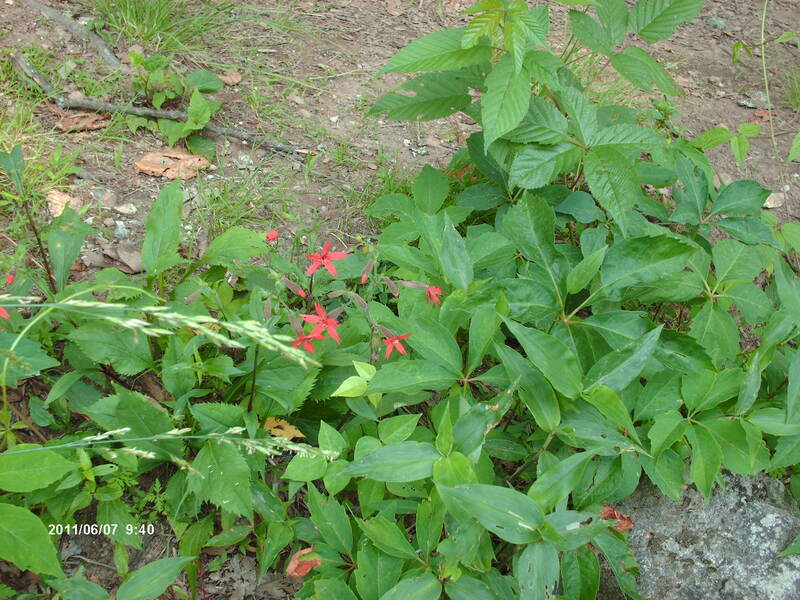 He found plenty of fire adapted plants growing between the oak trees including goldenrod, asters, rosinweeds, cone flowers, milkweed, false aloe, and spurges. Bartram noted that Indians set fires annually, and normally clear rivers turned black with ash. All southern pines are fire tolerant and adapted to survive in environments with frequent fires. Most oak species also are fire tolerant, though to a lesser degree than pines. 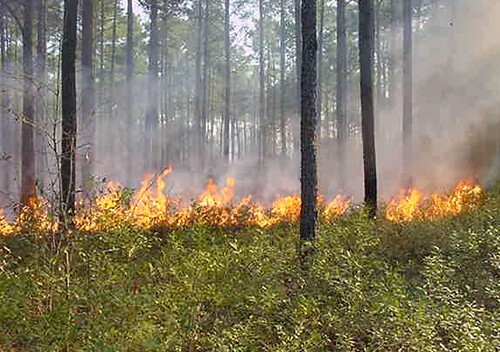 However, longleaf pine is adapted to fires as frequent as 1-4 years, a higher fire frequency than most oaks and pines can survive in the long term. The long pine needles form a sheath that protects the main stem of a sprout. 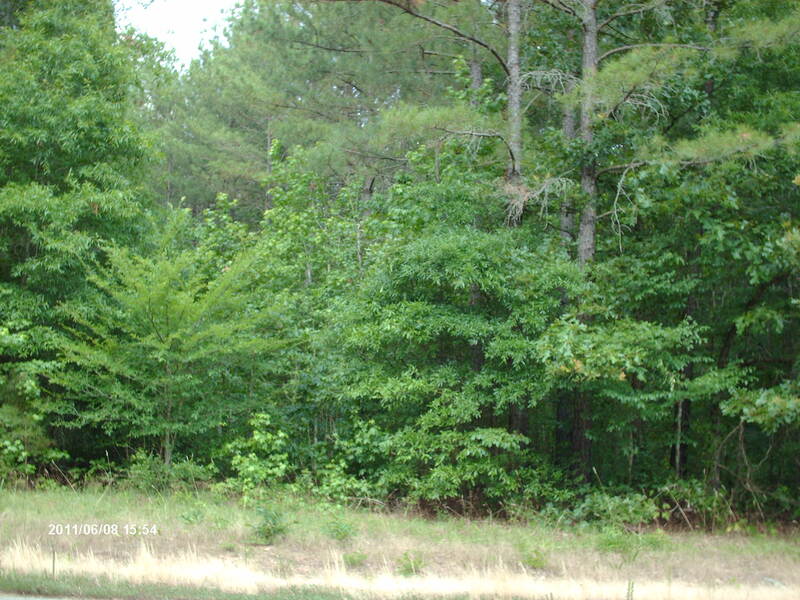 Mature loblolly pines, shortleaf pines, and many oak species survive light to medium fires, but their saplings can not. Longleaf pine saplings can survive fire, explaining why longleaf pine savannahs became the dominant ecotone on the coastal plain. 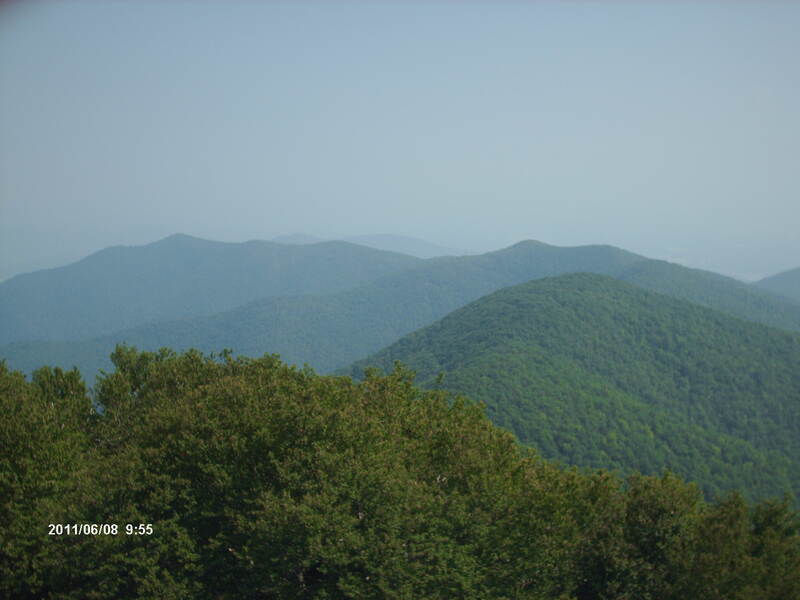 Fires were less frequent in the piedmont and mountains because rugged terrain and myriad creeks formed natural firebreaks. I’ve been a member of the Nature Conservancy for 22 years but have never visited one of their preserves. I had a sudden urge to see one, and the Moody Natural Area excited my interest. The Moody Natural Area is 8200 acres of sand scrub, open pine savannah, bluff forest, river bottomland forest, and cypress/tupelo swamp along the Altamaha River southeast of Vidalia, Georgia. I’ll have to wait til fall though because summer is too !#$! hot here in Georgia, and I don’t want to drag my poor wife and child out on another long field trip. To appease my eagerness to see this remnant wonder of nature, I studied satellite photos of the site and found some interesting geology. Below is a link to the satellite photo, but it won’t link directly to the area my sketch is based on. To find it, pan to the right and enlarge. Sketch of a satellite photo of Altamaha River adjacent to the Moody Nature Preserve. Note the oxbow lakes and paleomeanders. Both types of formations were former bends of the river that got cut off from the main channel. The paleomeanders mostly dried up and filled with vegetation. Both possibly formed as the Ice Age ended and precipitation increased making the river meander to a greater degree than it does presently. Paleomeander scars are evident in satellite photos of the Altamaha River. The Altamaha River used to flow through these spots, creating the visible incisions. Later, the river shifted to its present location and as always is still slowly altering its position. I don’t know whether geologists have ever studied the part of the Altamaha adjacent to the Moody Natural Area, but they have examined other areas along this mighty stream. They’ve excavated braided sands in terraces that date to the Last Glacial Maximum (~30,000 BP-~15,000 BP). I’ll explain what this means below. But first, I’d like to suggest that the visible paleomeander scars in my sketch based on this location of the Altamaha may date to the end of the Ice Age (15,000 BP-10,000 BP) when the river meandered to a much greater degree than it does now. Note that some of these scars still fill with water on occasion. Prior to this time period, there is only a limited amount of data studied, so I begin here. It’s likely, however, that time periods and climate phases discussed are repeated cycles that have occurred before. Climate fluctated rapidly before the LGM, alternating between stadial and interstadial. Stadials were periods of glacial expansion characterized by cold arid climate. Though glaciers never came close to what’s now Georgia, the change in climate had a significant impact on Georgia’s rivers. Long droughts lowered the water table and in many cases completely dried up tributaries. The major rivers became clogged with huge sand bars and islands. A decrease in vegetation along the rivers meant even more sandy sediment could accumulate. The surrounding landscape consisted mostly of pine and oak savannahs. Grasslands and sand scub grew in some places right up to the water’s edge. Interstadials were periods of glacial retreats characterized by cool moist climate. As the glacier to the north melted, moisture levels in the atmosphere increased as did precipitation. Though average annual temperatures increased, they were still lower than those of today. Interstadials likely had wet and dry seasons–late winter, spring, and early summer were wet; late summer, fall, and early winter were dry. Floods during the wet season accumulated river sediment; winds during the dry season converted this accumulation of sand into dunes. Because climate fluctuated during the this time period, Georgia’s rivers included a combination of meandering and braiding patterns. Temperatures and precipitation rates fell dramatically during the Last Glacial Maximum as the northern glaciers expanded as far south as what today is central Ohio. This caused water tables to drop creating braided river patterns. The Platte River in Nebraska is an example of a present day braided river pattern. Note the prevalent sparsely vegetated sand bars and islands. Georgia’s rivers looked much like this during the Ice Age rather than their present day meandering patterns. The climate was so dry that in some places eolian sand dunes born from riverine sand deposits blew across the landscape. Thinly vegetated grassland grew to the water’s edge in some areas. Geologists find braided river sands in terraces 0-15 feet above the floodplain adjacent to the rivers. Some sand dunes formed during this era are quite large but today are covered with vegetation and more recent sediment. Others have eroded away. Temperatures rose rapidly at the end of the Ice Age, albeit the rise was interrupted by a precipitous fall in in average annual temperatures during the Younger Dryas cold phase. As the Laurentide Glacier melted, there was a sudden increase in precipitation which caused massive storms and floods. Georgia’s rivers broke out of their braided pattern and began to meander to a greater extent than they do today. Flooding was more extensive as well. For the first 5,000 years of this time period scroll bars were prevalent but these decreased in abundance later. 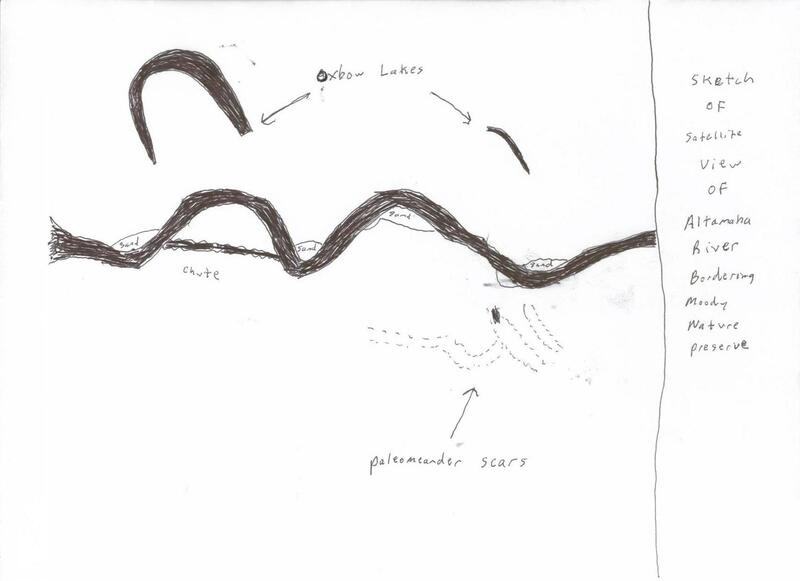 Scroll bars form when large meanders migrate and create ridges between old meander incisions. Meanders peaked in intensity about the time the great glacial Lake Agassiz in Canada broke through the ice dams and released most of its water. (See “Temporal Correlations between Lake Agassiz, the Okefenokee Swamp, and Ancient Flood Myths” from my January archives.) Rivers still meander but to a lesser extent since the atmosphere has stabilized. In the comments section of my post hypothesizing the extension of the brook trout’s range in Georgia during the Ice Age James Smith points out that this species requires highly oxygenated water as well as lower temperatures. Philip Juras painted the above portrait of Anthony Shoals in the Broad River. This looks like clear highly oxygenated water and potential trout habitat. Shoals like this occur as far south as Augusta. How far South did Brook Trout (Salvelinus fontinalis) Range in Georgia during Ice Ages? Illustration of a Brook Trout from Cornell University. No scientist has ever studied this topic, so my blog post is the first of a kind. Scientists are limited due to a lack of data–no trout fossils have ever been found in the region. There’s also a lack of interest, probably because I’m the only person in the world who daydreams about what it would be like to live in Georgia 37,000 years BP. I want to know, if I traveled in a time machine to live then and there, whether or not brook trout would get caught in fish traps I would place in the Broad River. I’ve concluded that it’s possible, maybe probable, that they did occur in the Broad River during stadials and even interstadials because summers were cooler then than they are today, an age within a full blown interglacial with hot summers. 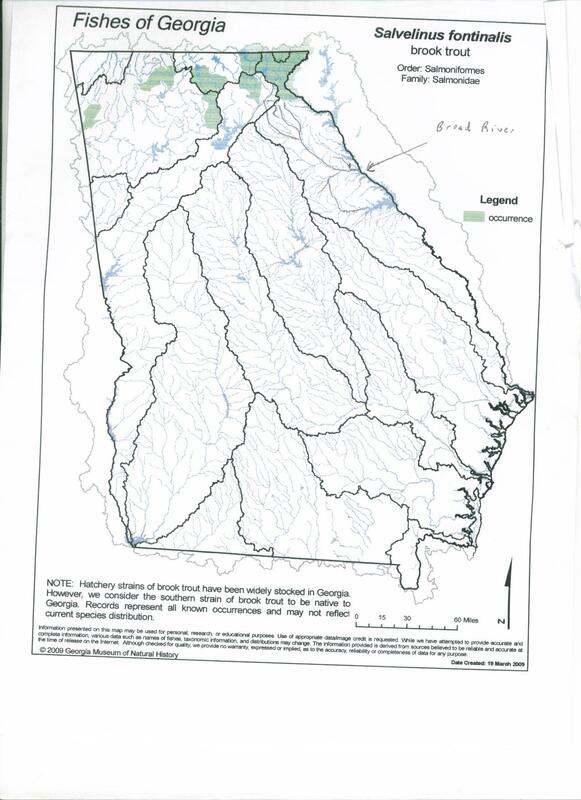 Present day Georgia brook trout range map. Map from the University of Georgia Museum of Natural History. Today, brook trout are the only native species of trout in Georgia, and as the above map shows, their natural range is restricted to the extreme northeastern region of the state with a few outlying disjunct populations, suggesting formerly a wider, more continous distribution. Temperature is one obvious limiting factor in their present day range. Brook trout suvive best in waters with temperatures between 55-65 degrees F. They can withstand water temperatures between 32-72 F, however, they can only live in warm waters of up to 78 degrees F for a few hours. Stocking trout in waters with temperatures greater than 70 degrees F generally fails in the long term. The temperature of the Savannah River near Augusta, Georgia on June 13, 2011 was 73 degrees F. (Modern reservoir temperatures are much warmer.) Water temperatures this warm and warmer are common during summer months in southeastern rivers, making them unsuitable for trout. Summer air temperatures in the southeast were much cooler during the last glacial maximum, and even during interstadials within the Ice Age, therefore water temperatures were as well. Data from isotopic oxygen ratios of fossil foraminifera in the Atlantic Ocean suggest average annual summer temperatures were 9 degrees F cooler. (See my May 15, 2011 blog entry for more detailed explanation of this.) Taking the present day summer water temperature reading from the Savannah River near Augusta (73 degrees F) and subtracting it by 9 = 64 degrees F…within the brook trout’s comfort zone. Potentially, trout could’ve lived as far south as what’s now Augusta. Trout also prefer shallow fast moving water–fingerlings like water that’s just 16 inches deep, and adults prefer the water slightly deeper than that. Trout stay in shallow water and avoid deeper water even if temperatures are cooler in the latter. Much of the present day Savannah River, besides being too warm, is too deep, but during the LGM arid climate lowered the water table, creating more shallow fast moving streams for trout. 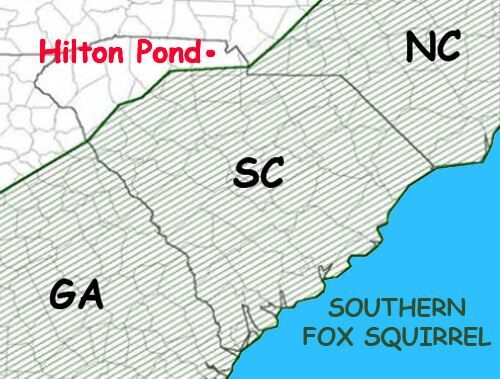 Suitable trout habitat likely existed in 2 notable streams that flow into the Savannah River: the confluence of the Broad River with the Savannah is only ~60 miles south of present day trout habitat, and the Little River’s confluence is only ~70 miles south. The headwaters of the Broad River is just a scant few miles from present day trout habitat. Both the Broad and the Little Rivers have the gravel and rocky bottoms brook trout prefer. During cooler climate phases, there was no ecological reason brook trout couldn’t have expanded their range at least that far south. The fossil record shows that many other species from northern climates extended their range farther south during the LGM including caribou, elk, woodchucks, bog lemmings, red backed voles, red squirrels, gray jays, pine siskins, wood turtles, and others. So it’s not only possible but probable brook trout did too. Unfortunately, finding Pleistocene fish bones in a region almost devoid of Pleistocene fossils is not likely, rendering my hypothesis difficult to prove. There are so many fossil sites in Florida that academic experts don’t have the time and money to excavate the all. Mark Renz, a professional fossil-hunting guide but not an academic expert, sought and gained permission to excavate 2 productive retention ponds in LaBelle, Florida. Giants in the Storm is about his experiences spear-heading that effort. His team found a truckload of fantastic fossils including lots of mammoth, mastodon, and horse material as well as specimens of llamas, flat-headed peccary, long-nosed peccary, white tail deer, Harlan’s ground sloth, saber-tooth, jaguar, bobcat, Armbruster’s wolf, alligator, and giant tortoise. The site is unique because it dates to the middle Irvingtonian Land Mammal Age (~500,000 BP). Though Florida has many fossil sites dating to the Rancholabrean Land Mammal Age (~300,000-~10,000 BP), and plenty from the late Pliocene/early Pleistocene (~2 million BP), the LaBelle fossil site is a rarity that helps fill in a gap in the fossil record, and it provides more specimens for comparison of the evolution of individual species. The site is located in southwest Florida. The types of mammals excavated here suggest the region was mostly grassland interspersed with riverine and lacustrine forests. Like the other Mark Renz book I reviewed, Fossiling in Florida, the best thing about this book are the copious photographs of fossils that are useful for amateur and serious fossil collectors. Some of my favorites include parts of the anatomy that don’t automatically come to mind such as a mammoth’s calcaneum (heel bone) and an hyoid (tongue bone) from either mammoth or mastodon. Of course, there were the usual proboscidean teeth, and spectacular fossils–a relatively complete mammoth skull and a 9 foot long, 300 pound tusk found in place but broken into 4 pieces. Mr. Renz imagined a single dramatic event, a storm of great magnitude causing a flood, as an explanation for why these fossils concentrated here. It gave him an excuse for a dramatic title for this book, but he concedes his title is a misnomer. After consulting with Richard Hulbert, curator of the University of Florida Natural History Museum, he agrees with the conclusion that all the fossil specimens were accumulated here gradually over a long period of time. 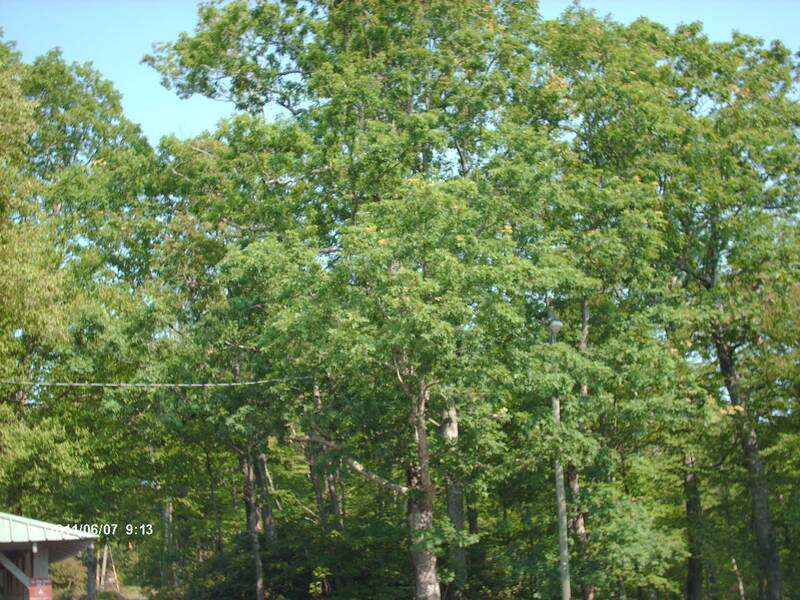 A greater variety of trees grow in the southern Appalachians than in any other region of the United States. The temperate forests in North America are more diverse than those of Europe because the mountains run from north to south instead of east to west. The ranges of European trees couldn’t retreat south when Ice Ages began–the Alps blocked their way. Late in the Pliocene many plant species disappeared from northern Europe, never to return there. But in North America, plant species ranges were able to expand and contract in correlation with the retreat and advance of glaciers. I visited Black Rock Mountain State Park near Clayton, Georgia on my vacation last week and enjoyed seeing the diversity of trees. I found white oak, black oak, red oak, sycamore, sweetgum, river or sugar birch?, elm, shagbark hickory, black walnut saplings (no mature trees), tulip, locust (Gleditsia sp.? ), red maple, southern sugar maple, hemlock, white pine, Virginia pine, and shortleaf pine. I also found a single chestnut but couldn’t locate the tree it came from. It’s likely from a sprout that will eventually succomb to the blight. The forests in north Georgia differ greatly from what I saw in the Great Smoky Mountains National Park last year (see “Gatlinburg Tennessee: Tale of a Tourist Trap Nightmare”). I barely saw any oaks in that park, but I noticed in north Georgia that white oak is one of the most common trees from Hiawassee to Clayton and black and red oak are abundant as well. The forests in north Georgia must be younger than those around the Great Smoky Mountains National Park. Oaks are fire tolerant/shade intolerant. Tulip and maple shade out oaks in old growth forests. 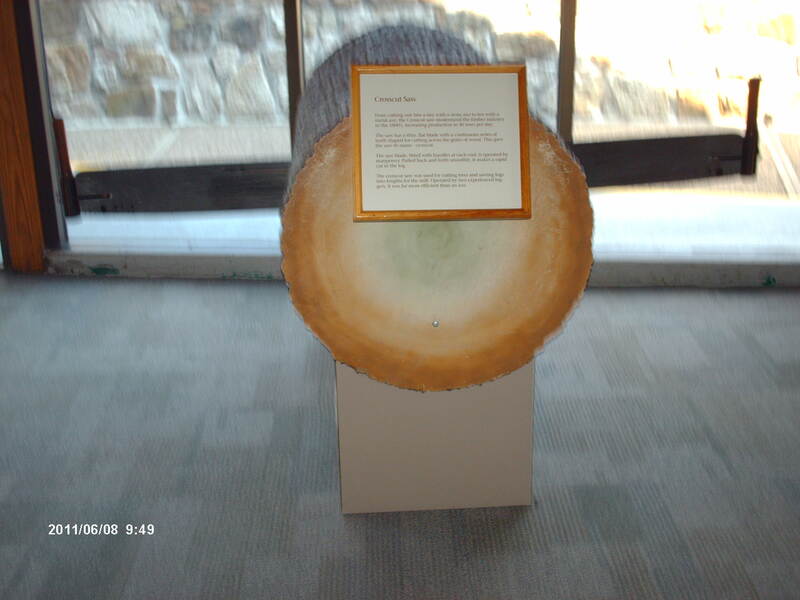 The National Park trees are also much larger in diameter. In north Georgia I couldn’t find a single tree greater than 3 feet in diameter. Black Rock Mountain State Park was purchased from private landowners in 1939, so the forest here is only 72 years old. I prefer the younger oak forest over old growth tulip and maple forests because they support more game. White oak in Black Rock Mountain State Park. White oaks are one of the most common trees in northeast Georgia but are declining in much of their former range in the midwest. White oaks are declining in abundance throughout much of their range due to fire suppression. In the midwest maples are replacing them, and oaks can’t grow in their shade. Fire destroys maple trees and opens up the forest canopy for oaks. I didn’t see any bird species in north Georgia that I don’t normally encounter in Augusta. However, blue jays were very abundant–they go hand-in-hand with white oak forests. Some scientists believe it was blue jays that helped facilitate the return of oak forests to the midwest and New England following the retreat of the Laurentide glacier at the end of the last Ice Age. In the region about 100-200 miles south of the ice sheet, oaks persisted in small thermal refuges alongside rivers, but these oak woodland relics were surrounded by boreal forests and prairies. 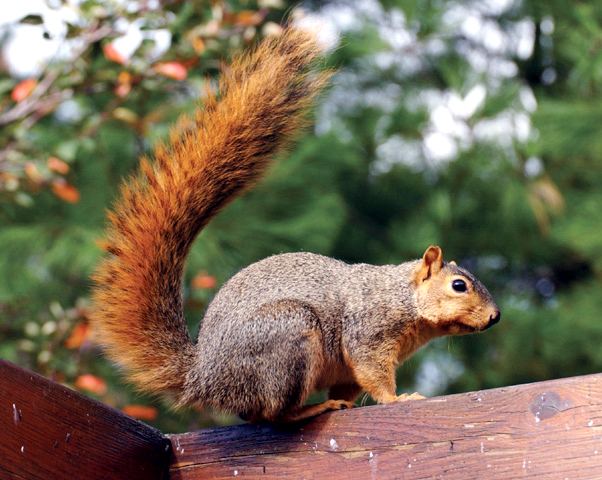 Blue jays carried acorns for miles, storing them for future use in hidden caches. Acorns never retrieved sprouted in sunny meadows and dying spruce forests that were failing due to a warming climate. A tornado wrecked this tree. 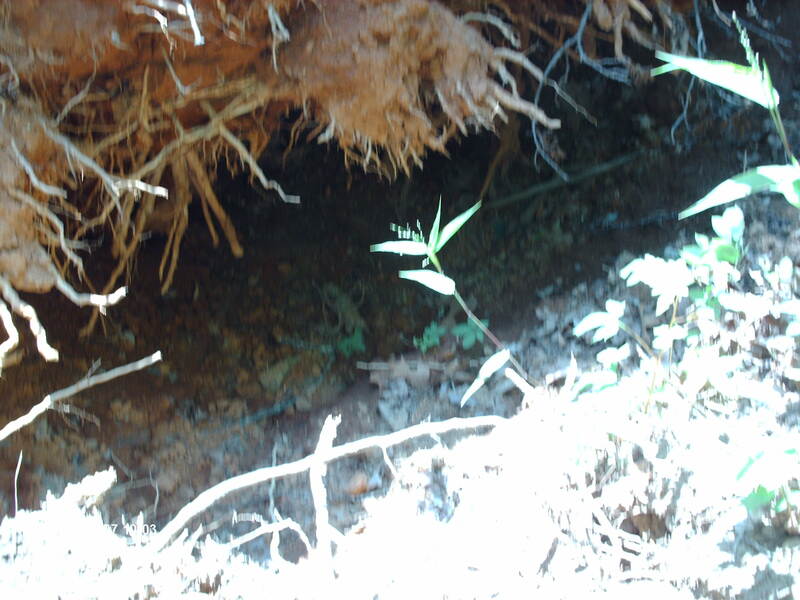 When a tornado felled this tree, the roots ripped a big cavern into the earth. This would make an excellent bear den with a fallen tree as a natural roof. The bear might dig making it a little deeper. Bears are unlikely to use this one though because it’s next to a trail. 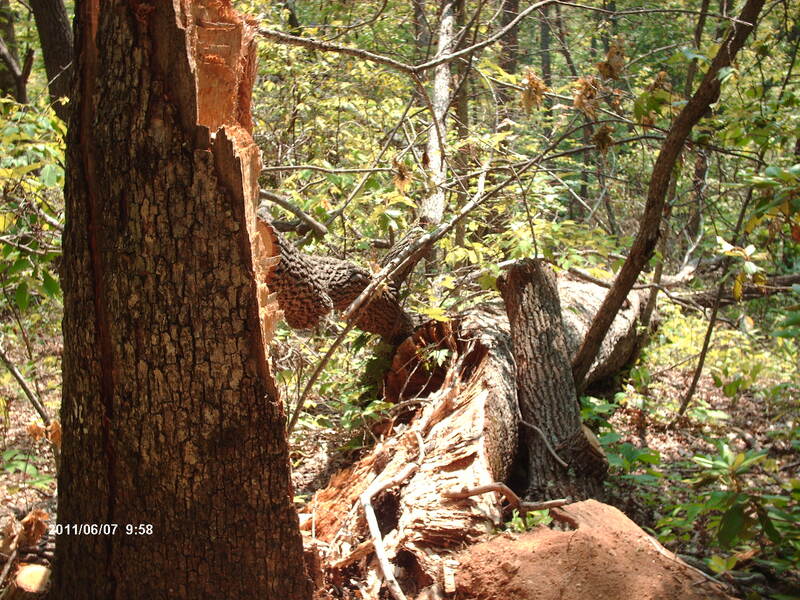 Earlier this summer, a tornado destroyed many of the trees on Black Rock Mountain. Roofers were repairing all the houses bordering the park. Many different kinds of flowers abound in sunny areas of the southern Appalachians. This one looks like some type of aster but I’m not sure. Maybe somebody can help me out with the ID. I also saw orchids, field daisies, and many I couldn’t identify. A chipmunk hole? I saw a chipmunk not too far from this hole. The park provides perfect habitat for chipmunks. They like to tunnel under tree roots and boulders, and there are lots of acorns. This is 1 of 2 species of mammals I observed in north Georgia that I don’t get to see in Augusta. 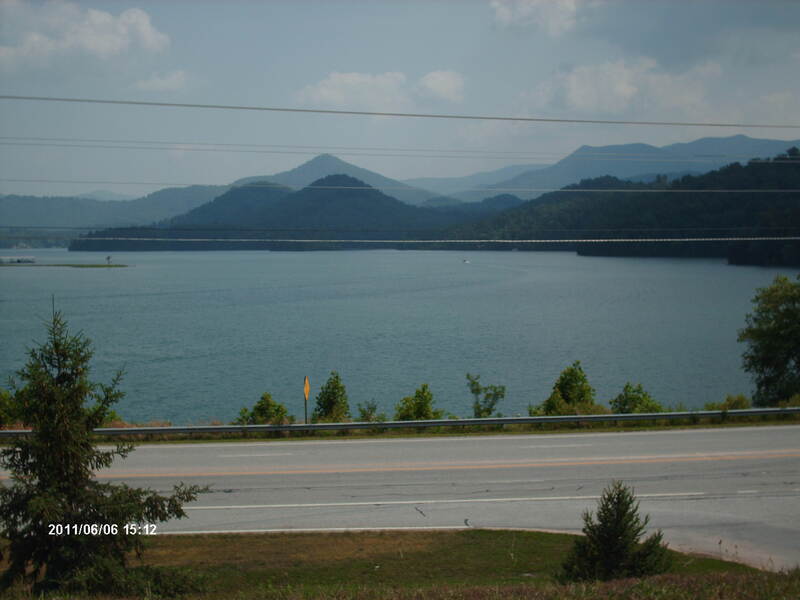 We stayed at the Ramada Inn across from Lake Chatuge (pronounced Chatoo as in Achoo…bless you for sneezing), an artificial reservoir created by a dam that backflows the Hiawassee River. They have a handsome living room. 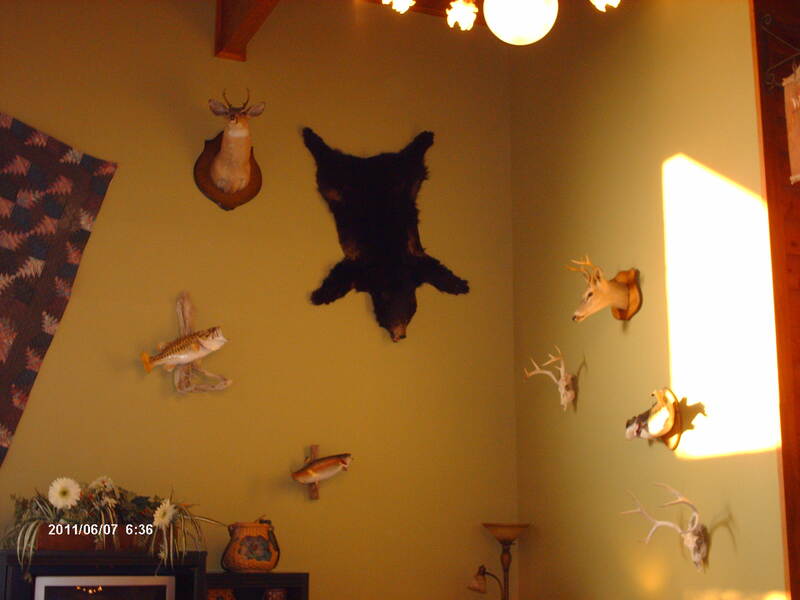 Bear skin rug and other trophies decorate the living room at the Ramada Inn in Hiawasee. The lake meanders in front and in back of the hotel, but to get to the swimming beach it’s necessary to cross a fairly busy road. The lake abounds with green bream which swarmed around me while I swam. View of Lake Chatuge from the Ramada Inn. 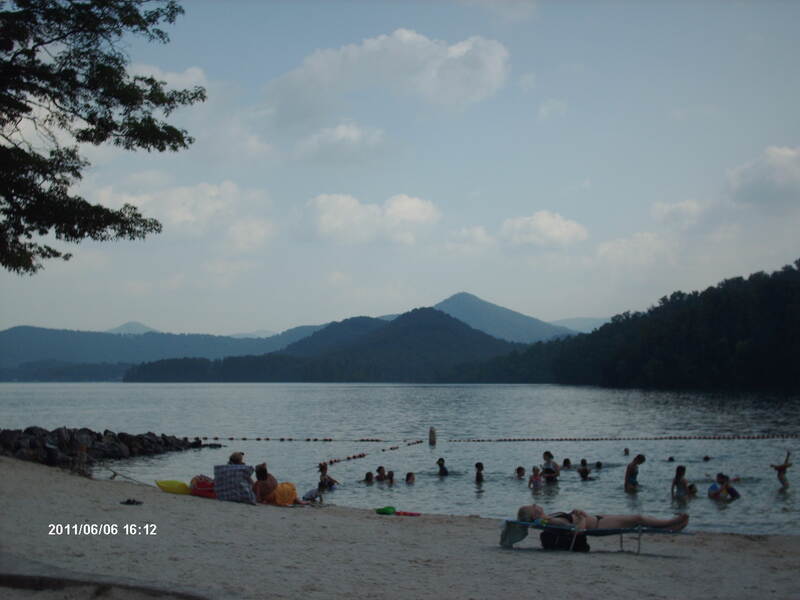 Swimming beach at Lake Chatuge. The good looking woman in the foreground was marred with tattoos. What is it with tattoos these days? It used to be just bikers and sailors had tattoos and they were small and tasteful. Now wimps and women have big ole ugly tattoos all over their bodies. The Cherokee Indians originally settled Hiawasee which was a major village on an Indian trail through a pass between the mountains, and they lived here until 1836 when greedy white crooks kicked them to Oklahoma. A small patch of clover behind the hotel attracted a pair of fat woodchucks every afternoon. Woodchucks are close to the present southern limit of their range here, so I got to see another animal that doesn’t live in Augusta. During the Ice Age woodchucks occurred as far south as Brunswick–their fossil remains having been excavated from Clark Quarry. This is the best photo I could get of the woodchucks that live behind the Ramada Inn. I just missed getting a closer image. It went down the hill, eating like a little hog all the while. 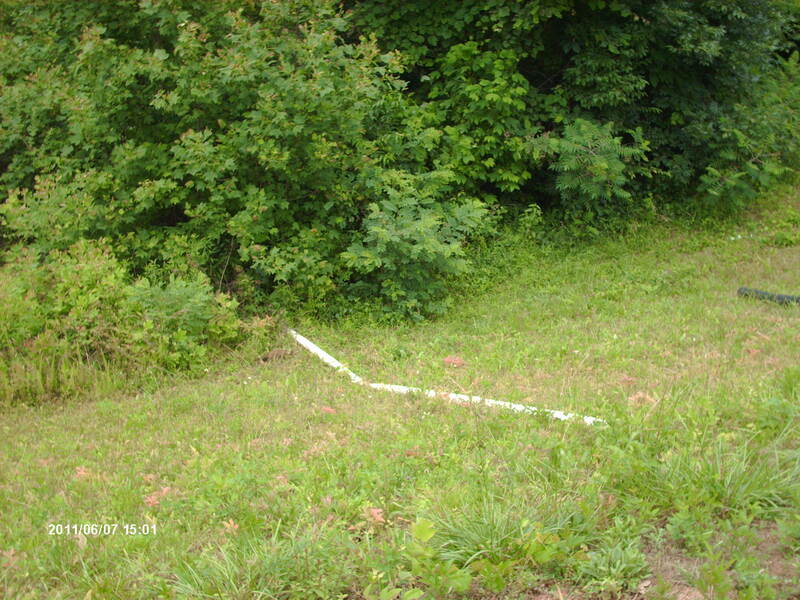 Click on the photo to enlarge and look to the left of the white pvc pipe. There are no restaurants to get excited about in Hiawasee. The people who live in north Georgia must not believe in seasoning their food. 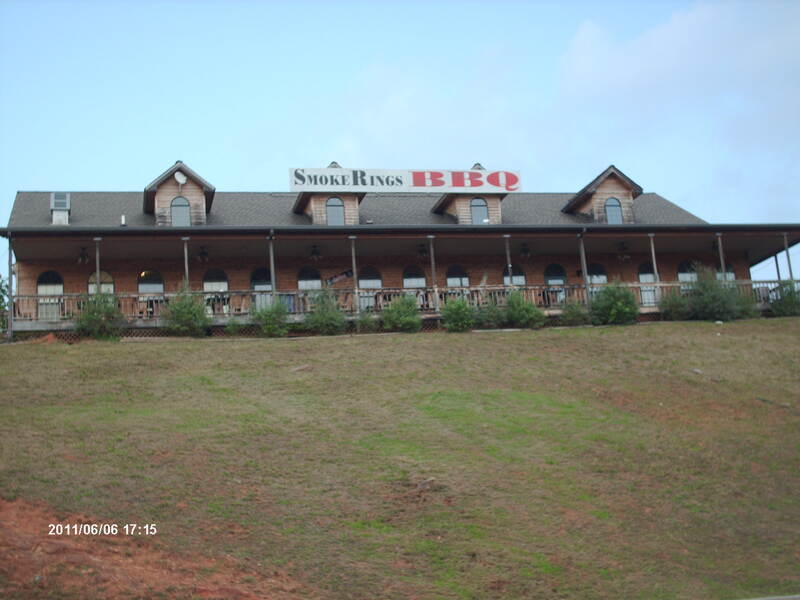 We didn’t get to eat at the Smoky Rings Barbecue. They had no handicapped access–the first with no wheelchair ramp I’ve ever seen anywhere. At Daniel’s Steakhouse my daughter ordered a sirloin steak which was grilled to perfection but unseasoned. They didn’t season my trout either. The average age of their customers is 70. Perhaps that’s why the restaurant served such bland food. Older people are supposed to watch their sodium consumption, and they probably complain if food is too spicy. I regard bland food as an abomination. Here’s my recipe for steak seasoning salt: 2 tsp salt, 1 tsp ground black pepper, 1 tsp celery salt, 1 tsp garlic salt, 1 tsp onion salt, 1 tsp ground coriander, a few scant drops of soy sauce. Mix all the salts and spices on a plate. Be careful with the soy sauce–too much and the mixture will clump up and won’t go through a salt shaker. Pour this mixture into a salt shaker. Sprinkle liberally over steaks and chops, or in ground sirloin for chopped steaks and gravy. Here’s my recipe for fish coating: 1/2 cup flour, 1/2 cup cornmeal, 1 tsp ground black pepper and lots of freshly ground black pepper, 1 tsp garlic salt. Dip the fish filets in beaten egg, then in the flour and spice mixture before frying. Adding egg, buttermilk, and minced onion to the above recipe makes an excellent hushpuppy batter. Cut fish fillet into fingers and dip it in the batter before frying and use the leftover batter for hushpuppies. All-you-can-eat buffets are popular in Hiawasee. It’s hilarious to watch how much food some of these old folks can put away. I guess they think they’re making a profit, if their stomach capacity surpasses the restaurant’s cost of the food. The other local restaurant we tried was called Georgia Mountain Country. Again, bland food rules here. On the buffet blackeyed peas were served separate from ham. The peas were unsalted, but mixing them with the ham made it acceptable. Pole beans mixed with fatback were cooked to smithereens. I think this recipe is based on an old pioneer dish. The pioneers used to store pole beans by stringing them together and drying them, creating something called leather breeches beans. To make them palatable, it was necessary to stew them with salted pork for hours. In modern times it’s no longer necessary to cook them this way. To produce a similar taste, steam pole beans until just tender and drizzle a little warm bacon grease on them. The cornmeal muffins served were dry as a desert and not a pat of butter in sight. I did enjoy the baby beets, despite the lack of seasoning, because they were fresh and naturally sweet. The best meal I ate was in a bar in Helen where we stopped for lunch on the way home. Helen is a tourist trap–everything is more expensive because the town is built to look like a German country village. I ate a bratwurst served on a fresh baked herb roll and smothered with sauerkraut and cheese. Too bad I was driving and couldn’t wash it down with a beer or three. On the way home I stopped and took a photo of the approximate location of the Great Buffalo Lick, according to Dr. Devorsey. Approximate correct location of the Great Buffalo Lick, according to Dr. Devorsey’s research. It’s ~.5 miles south of Buffalo Creek on Highway 22. Today, it’s just nondescript second growth. Buzzing bees weaved through the blooming mountain laurel as I ascended the half mile trail leading to Brasstown Bald, the highest elevation in Georgia at 4784 feet above sea level. A fragrant aroma from the laurel flowers permeated the air, though in some places the smell was a bit funky as if fallen flowers were composting. Mountain laurel alongside the trail leading to Brasstown Bald. I took all the photos for this blog entry. Oppressive 95 degree F heat wilted most of the rest of the state, but I was cool here, a pleasant breeze provided a natural fan that wasn’t even necessary because the thermometer on the mountain top read 70 degrees. Last week, I incorrectly supposed that, unlike in Russian’s far east, Georgia’s temperatures never fell to -40 degrees F, even during severe glacial cycles. I stand corrected–the record low at Brasstown Bald since man has recorded temperatures here is -27 F, so surely Ice Age temperatures at this location fell even lower, perhaps colder than -40 F.
Brasstown Mountain is a heath bald and has a different origin from grassy balds which likely were created and maintained by a combination of severe climate and megafauna trampling and grazing. Heath balds grow in areas with thin acidic soils. Trees become stunted and shrubs dominate. 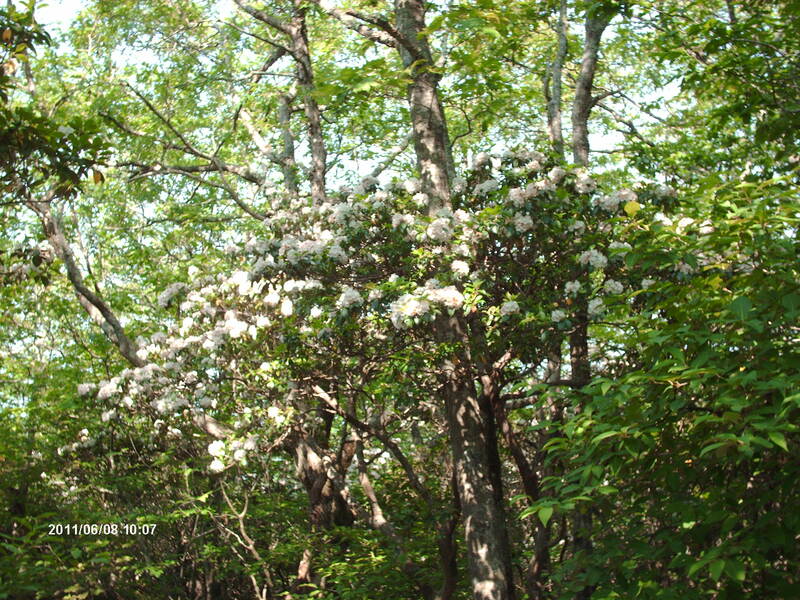 Mountain laurel and sumac cover much of Brasstown Bald. Birch, white oak, hemlock, and maple grow here and there but few are more than 30 feet tall. Even so, they’re not nearly as stunted as trees that grow in alpine meadows. Exposed paleozoic age rock. 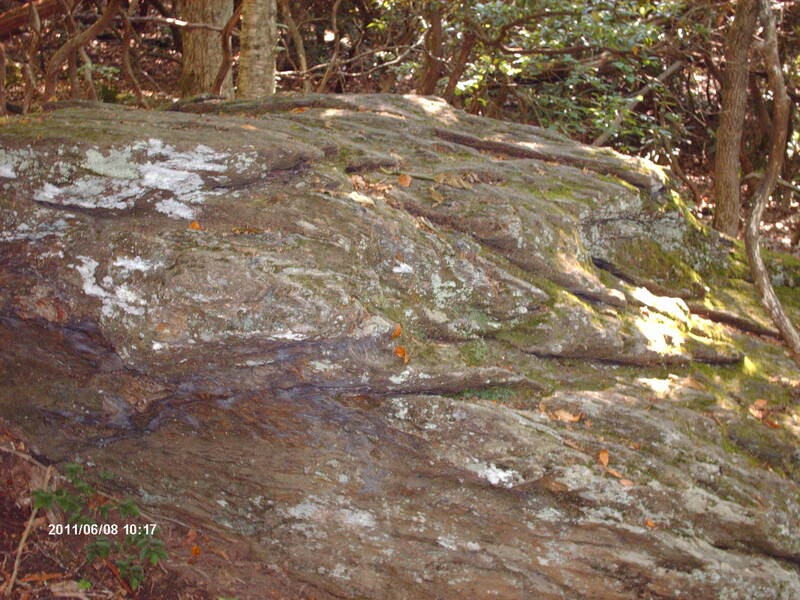 Thin soils grow over the rock layer on the top of Brasstown Bald, partially explaining why it’s dominated by shrubs. Tree roots just can’t grow deep enough to facilitate growth. 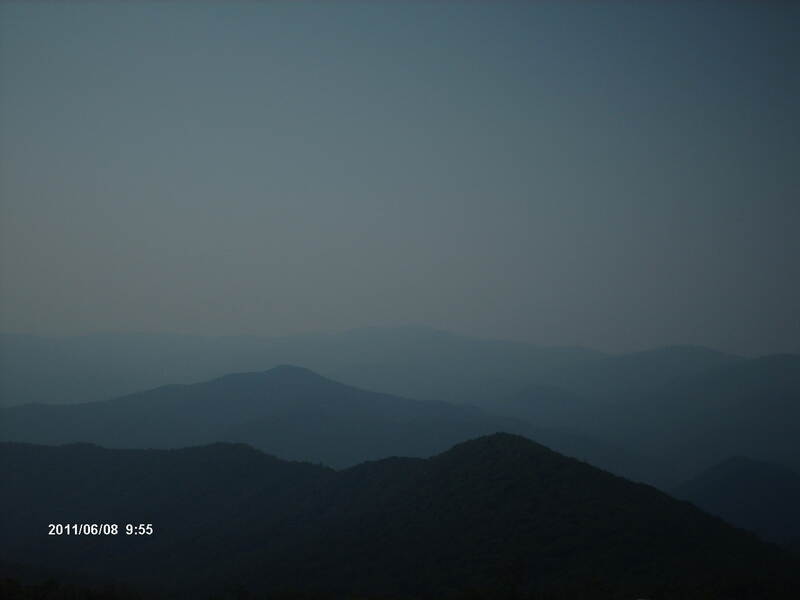 Another view from Brasstown Bald. 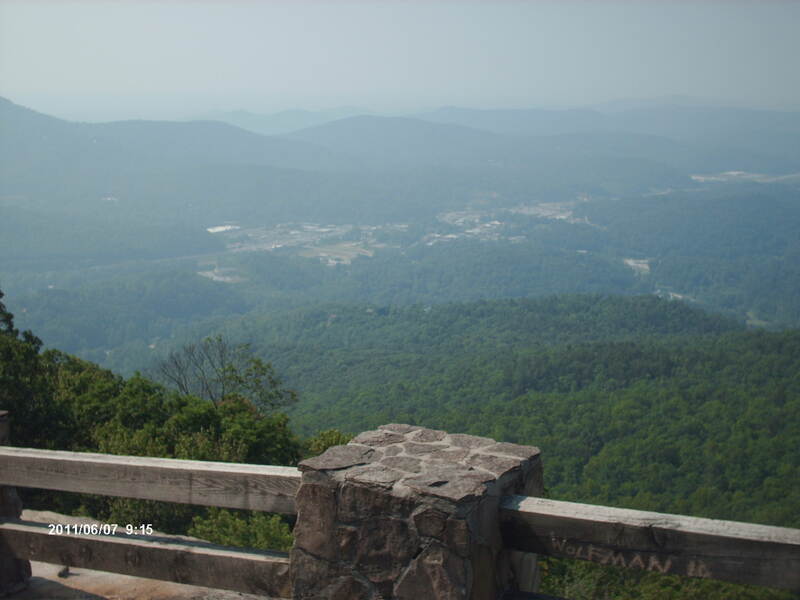 The name, Brasstown Bald, is based on a complete mistranslation of the original Cherokee name for the place. The Cherokee Indians named the village here where they lived, “Unripe Vegetation.” The Cherokee word for unripe vegetation sounds much like the Cherokee word for brass. A European mistranslated the name from the Cherokee language. Brass has nothing to do with the mountain. At the top of the mountain is an interesting museum. It took the early pioneers a whole day to fell a tree with a saw like this. Nevertheless, by the early 1900’s, most of the original forest in the southern Appalachians had been clear cut. Although covered by forest today, this is second growth. 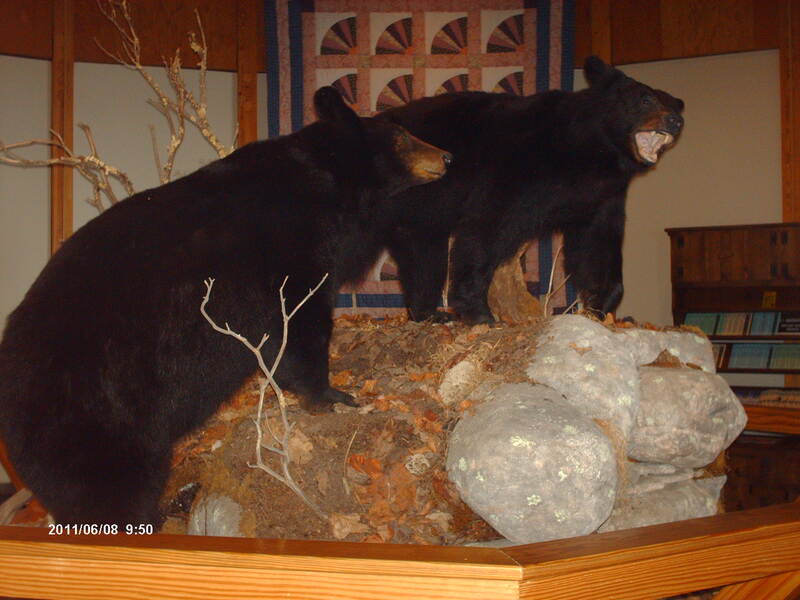 Mounted black bears at the Brasstown Bald museum. Supposedly, bears still roam the north Georgia mountains. I’ve never seen a live one, nor any sign of one. 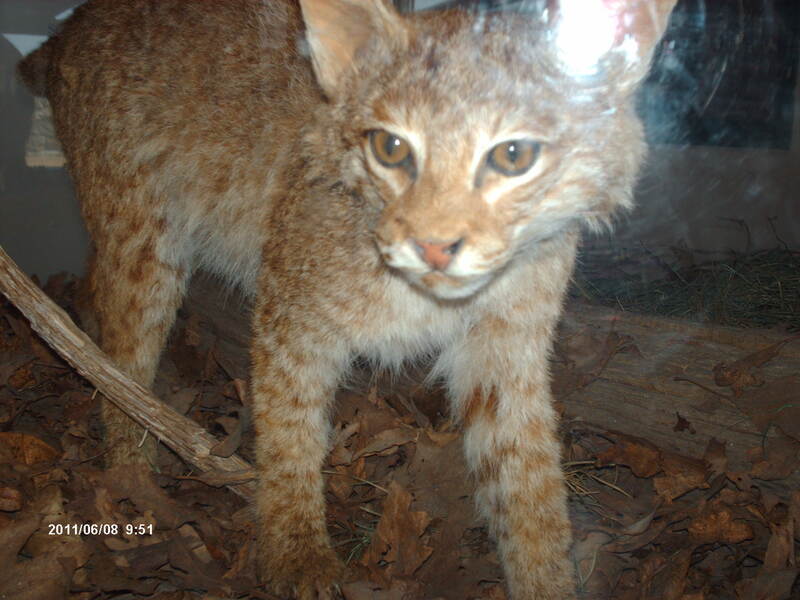 Mounted bobcat at the museum. I did see a live bobcat once, across the street from my house in Augusta, Georgia. Indian weapons. 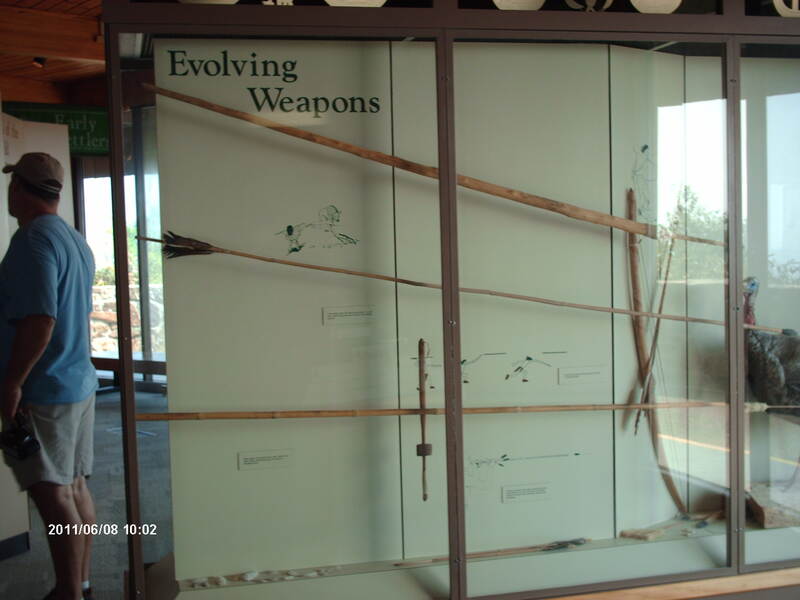 That atlatl is much longer than the one I have. I would like to commend the National Forest Service for making Brasstown Bald handicapped accessible. A shuttle van runs up the mountain every 15 minutes or so. The man let us follow him up there in my car. The museum has an elevator, wheelchair ramps, and nice clean bathrooms. My wife was able to wait for us in the cool shade, while my daughter and I hiked up and down the trail. The trail is steep requiring a hiker to be in good shape. I jog 3 miles 4 or 5 times a week, so it wasn’t hard for me, but out of shape folks will want to take advantage of the shuttle van. Before I got distracted with last week’s blog entry about North American dholes, I meant to write about the ecology of Russia’s far east and how it may be the closest extant equivalent to that of the Pleistocene in southeastern North America. Of course, there are many differences–the climate of Russia’s far east is more severe than Pleistocene Georgia’s. I doubt temperatures ever dropped to -40 degrees F in Georgia, even in the mountains during extreme glacial phases. And Russia’s far east lacks extra large beasts such as giant ground sloths and mammoths (elephants and rhinos used to live just south of the region). However, it does host a remarkable diversity of large mammal species, and the environment is reminiscent of what covered the upper south in North America during the Pleistocene. And until 100 years ago this ecosystem was relatively intact. Unfortunately, the free market forces that control Russia now are rapidly degrading the environment here. Siberian aka Amur tiger. Notice how big they get. This apex predator is the ecological equivalent of the Pleistocene age Smilodon and Panthera atrox (see my July 2010 entry “Panthera atrox! What kind of Cat was it?”). All photos in this entry found from google images. Note: the original post had a picture of a Liger instead of a Siberian Tiger. I couldn’t find a good photo of a Siberian tiger next to a human as a size comparison. I reckon not too many people want to pose in a cage with a tiger. A boreal forest, known as the taiga, dominates the northern region, and higher elevations of the mountains in the south. It consists of Korean pine, spruce, larch, and fir. Rocky alpine meadows are found at high elevations. To the south and at lower elevations the boreal forest grades into a mixed Korean pine and Mongolian oak forest with many different species of plants such as birch, elm, maple, chestnut, walnut, bamboo, and wild kiwi vine. The Pleistocene of southeastern North America was also much like this: boreal forest interspersed with meadows in the mountains, mixed pine and oak forest with canebrakes along the creeks in the piedmont. Tigers and most of their prey widely utilize the mixed pine and oak forest, but merely travel through the boreal part of their range. The temperate forest at lower elevations produces all the mast, the acorns and pine nuts, that potential prey such as deer and boar eat. 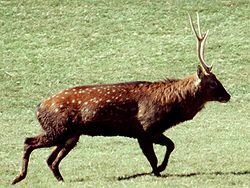 Sika deer. Note the spots. Is there a close evolutionary relationship between this species and the American white-tail deer? 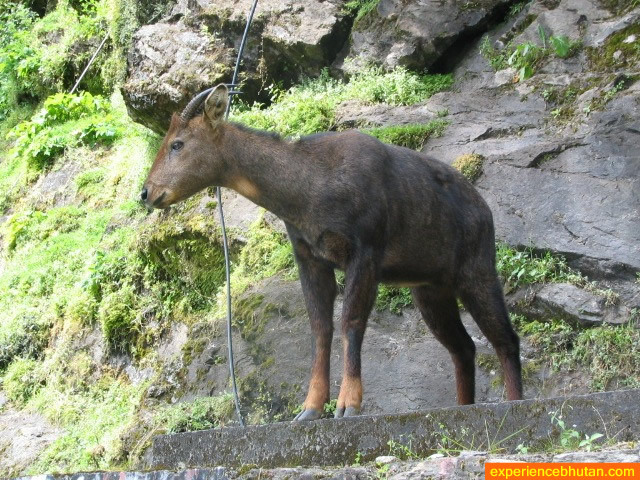 Musk deer. Wow! A fanged deer. A ghoral–a type of goat antelope. Russian wild boar killed in Texas. Note the size. Raccoon dog, not to be confused with the American raccoon. This species is mostly a scavenger. The list of animals that live here is impressive: Siberian tigers, leopards, lynx, wolves, dholes (formerly. Dholes have been extirpated from the region), raccoon dogs, wolverines, brown bears, black bears, moose, elk, caribou, Sika deer, roe deer, musk deer, ghorals, wild boar; and along the coast, harbor seals. Tigers eat them all. It’s surprising to learn that bears (both black and brown) make up 5%-8% of the Siberian tiger’s diet. Tigers use a technique that makes them kind of a quick knockout artist. A tiger creeps up on a bear from behind some large object such as a boulder, and then leaps on top, quickly grabs under the chin, twists it, and bites through the spine, paralyzing the bruin instantly. Incredibly, tigers may even lure bears by imitating their vocalizations. It’s important for tigers to score a quick knockout over bears. Eurasian brown bears are the same species as the American grizzly, and they weigh up to 1000 pounds. They’ve been known to kill tigers in disputes over carcasses. Although there are only 8 documented cases of tigers killing wolves, one study concluded that tigers depress wolf populations. The scientists theorize tigers deliberately extirpate wolves, a rare case of one apex predator purposefully exterminating another. Wolves are rare to absent in regions where tigers now range, but early in the twentieth century, they were common here. This correlates with a decline in tiger populations then due to human hunting. But the old Soviet Union decided to protect Siberian tigers. As Siberian tiger populations rebounded, wolf populations almost disappeared completely from the region–packs are nonexistent. This makes me wonder about predator interactions in Pleistocene North America. How did saber-tooths, scimitar-tooths, giant panthers, jaguars, cougars, dire wolves, timber wolves, red wolves, dholes, and bears compete? Did some species deliberately try to exterminate others? One study of bone chemistry from fossils found at Ranch La Brea concluded that saber-tooths, dire wolves, and giant panthers competed for the same prey. I suppose populations of large carnivores fluctuated based on which was lucky enought to win interspecific encounters. Others may have become more common by avoiding battles. Anyway, it’s intriguing to think that a big cat may have kept dire wolf populations low in some areas of North America. In the south dire wolves and jaguar fossils are the most commonly found of the large carnivores, suggesting they were the most abundant, and that they co-existed. But all those other species did occur also, and they had an impact on each other that probably differed according to local conditions. The people who live in the remote wilderness region where Siberian tigers still roam are very poor. Most can only afford ancient, obsolete shotguns and rifles that will not kill a tiger immediately. Siberian tigers are adapted to cold temperatures and are covered with thick hides and a layer of fat impervious to inadequate ammunition. Nevertheless, hunters desperate for money will attempt to hunt tigers. With low quality gear they occasionally wound a tiger, turning it into a man-eater. Deaths and maulings are becoming more common. On the other hand mafia-funded poachers with high powered rifles are decimating Siberian tiger populations–less than 400 remain in the wild. Tigers are also known as Toyotas in Russia because they’re worth as much as a new car. The Chinese think tiger parts are aphrodisiacs which is what gives the big cats such astounding monetary value. Maybe the Chinese can be convinced that with the development of Viagra, they can now have a more proven and much cheaper way to increase their libidos, not that they need it (1 billion strong and growing). This book is the source for much of the information I wrote about above, though I did peruse some of the original scientific studies. Mr. Valliant writes an excellent story in creative non-fiction style. It’s based on a true account of Project Tiger’s determined effort to hunt and kill a man-eating tiger before it struck again. The reader gets to intimately know the characters of those involved including the victims, the tiger hunters, and the tiger itself. Vladimir Markov was a man with a sense of humor, popular with the townspeople, and not just some anonymous peasant eaten by a tiger. Yuri Trush, a macho, tough but lenient warden leads the dangerous hunt for the man-eater. Because of the subject matter, I would’ve read this book if it had been written by a constipated hack. Much to my delight, Mr. Valliant’s writing style was as pleasing to my literary appetite as it was to my hunger for the subject matter. For example he describes one subsistence hunter’s cabin as a “rhombus” because it was rectangular and tilted. For natural history buffs this one is a must read. Did the dhole (Cuon alpinus) range into southeastern North America during the Pleistocene? Photo of dholes from google images. John Valliant sets the scene in his excellent non-fiction book, The Tiger, with a description of Russia’s far eastern flora and fauna. Of the latter he mentions the dhole (Cuon alpinus), a medium-sized canid that no longer exists where Siberian tigers now roam, but still clings on to its last strongholds in India and a few neighboring countries. Upon reading this, I remembered Bjorn Kurten’s brief account of dhole fossils found in North America. In Pleistocene Mammals of North America he stated that dhole fossils were found in at least 3 sites in Alaska and 1 in Mexico. This means the species existed throughout the center of North America and perhaps in other regions as well. Richard Reynolds, formerly curator of the Los Angeles Museum of Natural History, first identifed 7 specimens (lower jaws and teeth) of dholes that were excavated from San Josecito Cave in northeastern Mexico. In 1971 Ronald Nowak examined the specimens and confirmed that they were from dholes. Dr. Nowak is the world’s foremost authority on Pleistocene canids. However, the specimens weren’t described in the scientific literature until 2009, and scant attention was paid to the role dholes played in North American ecology. I can remedy that, at least on my blog. Map of location of San Josecitos cave, and a photo of early excavation at the site. 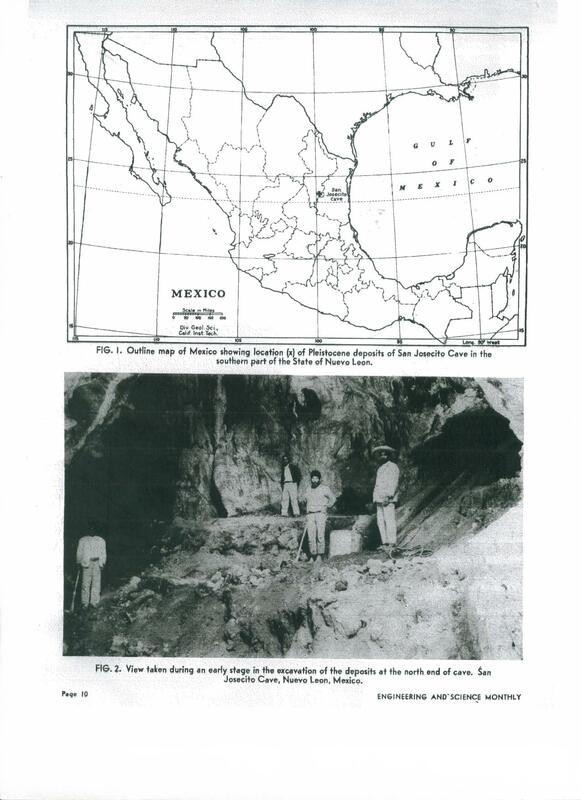 From “The Cave of San Josecito Mexico: New Discoveries of the Vertebrate Life of the Ice Age” by Chester Stock in Engineering and Science Monthly (circa 1940?). 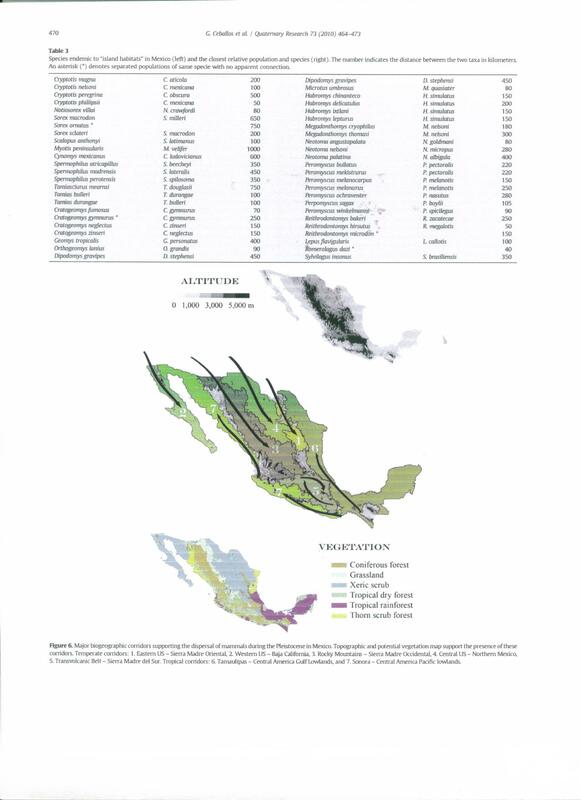 Map of ecological corridors from Mexico to the rest of North and Central America. During the Ice Age when dholes were present, mixed pine forests displaced what’s now xeric scrub. Dholes could have colonized the southeast from the gulf lowland corridor. From “Effects of Pleistocene Environmental Changes in the Distribution of Community Structure of the Mammalian Faunas of Mexico” by Gerardo Ceballos; et. al. 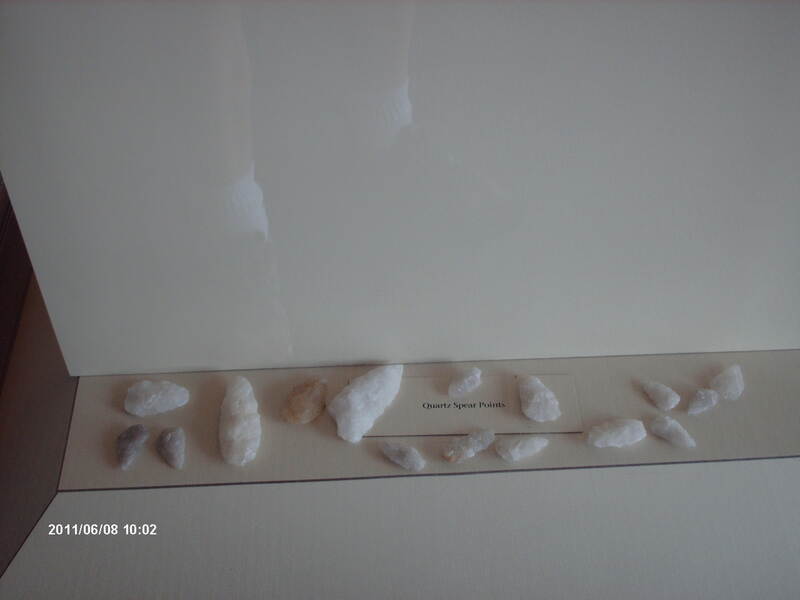 in Quaternary Research 73 (2010) page 470. I think it’s quite possible dholes periodically colonized parts of southeastern North America but without fossil evidence, there is no way of knowing for sure. Their preferred habitat is montane forests of about 3000 feet in elevation, though they can adapt to steppe-like environments, and jungles. The mixed forests in the piedmont and mountain regions of what’s now Mississippi, Alabama, Georgia, Tennessee, and the Ozarks of Arkansas would have been ideal and potential habitat for them. They must have found a suitable corridor of habitat along the Rocky Mountains because they found their way from Alaska to Mexico. Despite the lack of fossil evidence, they must have inhabited the region in between. How far east they ranged is unknown. 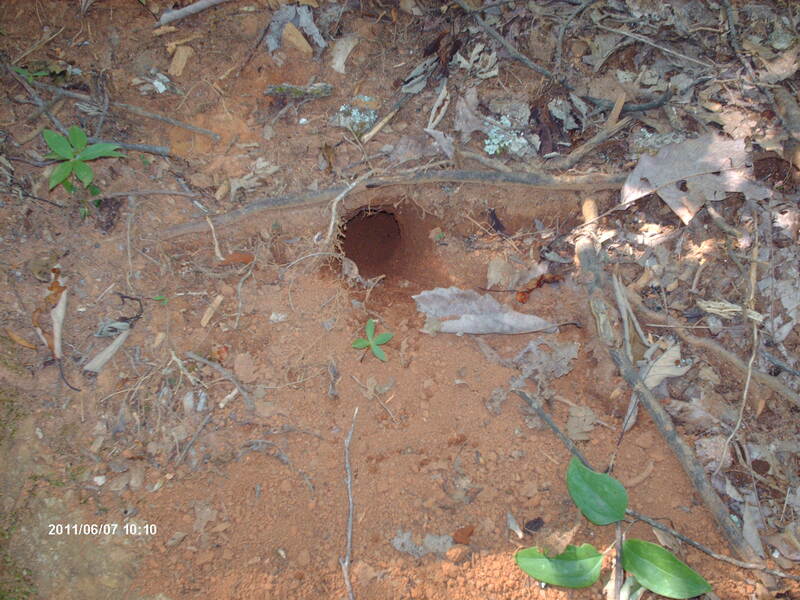 Florida’s rich fossil record draws a blank for dholes. However, Florida’s fossil record also draws a blank for red wolves (Canis rufus). It’s likely red wolves were regionally present in low numbers during the Pleistocene because they became the dominant canid here following the extinction of dire wolves. Moreover, collared peccary and giant short-faced bear (Arctodus simus) fossils weren’t known from Florida until within the last 5 years, so dhole fossils may yet be discovered somewhere in the southeast. As the old chiche` goes, absence of evidence is not evidence of absence. There may be evidence from Georgia–a tibia from a medium-sized canid was excavated from Kingston Saltpeter Cave in Bartow County. Unfortunately, scientists require skulls and teeth to determine canid species. The tibia could be from a dhole…or a coyote, a juvenile wolf, or even a paleo-indian’s dog. One further note on the absence of dhole fossils in the southeast–the odds of an individual animal becoming a fossil are unknown but may be 1 in a million. 900,000 dholes could have lived in the region over the millenia, but that number wasn’t high enough to significantly increase the chances of one of them becoming a fossil. How did dholes interact with North America’s Pleistocene fauna? Dholes live in packs of 10-12 but sometimes multiple packs temporarily merge forming groups of up to 40. Despite including individuals only weighing 25-40 pounds, these expanded packs have been reported to successfully attack large buffaloes and even tigers. The packs do suffer considerable mortality when battling these ferocious foes. A tiger can kill a dhole with just a blow from its paw. Perhaps, dholes occasionally attacked saber-tooths. Maybe that’s why they’re not common in the fossil record–saber-tooths may have dispatched a whole foolhardy pack. Dholes are less intelligent than wolves. Dholes may on occasion attack large dangerous prey, but one study found that their preferred prey selection was of individuals weighing between 60-350 pounds, and the average kill weighed 86 pounds. Deer, peccary, juvenile horses, and bison calves would’ve been their preferred prey in North America. By comparison, in that same study, the average kill of a tiger was 180 pounds. So dholes probably selected for smaller prey than dire wolves, saber-tooths, scimitar -tooths, jaguars, and giant panthers (Panthera atrox), and thus occupied a slightly different ecological niche. In a correspondence with Dr. Nowak I suggested that, based on their rarity in the fossil record, dholes didn’t compete well with dire wolves. He thinks it was competiton with timber wolves (Canis lupus) that may have kept their numbers low here and possibly caused their extirpation on the continent. However, I hypothesize that it was the extinction of the megafauna, not interspecific competition, that led to their demise in North America and Europe. The existence of large amounts of meat in the form of mammoths, mastodons, and giant ground sloths was a boon to carnivores and scavengers. Though dholes didn’t actively hunt them, when one of these great beasts died a natural death, they provided a feast for predators of all kinds, contributing to an increase in their survival rate and diversity. I can just imagine a pack of quick dholes aggravating a saber-tooth or giant bear until they abandoned the carcass. But today, dholes only survive in ever shrinking territory. It would be a shame to lose them. San Josecito Cave is a spectacular fossil site, eighty feet in depth. The matrix originally excavated was 60 feet thick in fossils. Scientists are still excavating the site, even though excavation began in the 1930’s. At least 62 species of bird fossils have been found here. Here’s a partial list of species found at the site. * denotes extinct species. You are currently browsing the GeorgiaBeforePeople blog archives for June, 2011.